It’s back!! The fan-favorite Apples Against Humanity is returning as a monthly installment. What is Apples Against Humanity? It’s Family Game Night gone wrong! 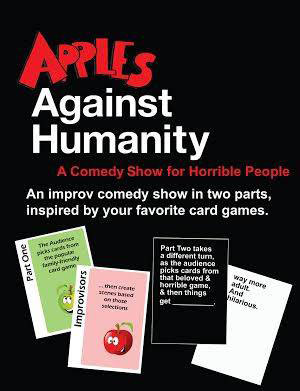 In the first half of our show, our improvisers create scenes based on audience-chosen cards from everyone’s favorite family-friendly card game “Apples To Apples”. Then, the second half takes a decidedly different turn. Using suggestions and inspiration from everyone’s favorite adult-friendly card game, “Cards Against Humanity”, the results are far more adult (and hilarious). Next show: April 19th, 10:00 pm–tickets available now!